Our Server is down at the moment so the pattern isn’t available. I will update with a new link when I get it working! Sorry for any issues! YARN: Lion brand Homespun (185 yd/169 m), shown in Fiesta color way, 2 skeins. You may substitute any other bulky (weight category 5) yarn. GAUGE: Gauge is not important in this pattern. It is worked from the top down and therefore you can work until you run out of yarn, or you are happy with the size of the finished shawl. 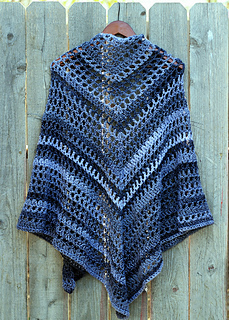 FINISHED SIZE: Shawl shown used all but 2 ft of the second skein of yarn and measures approximately 70 inches from tip to tip and 35 inches from the top of the back to the bottom point. 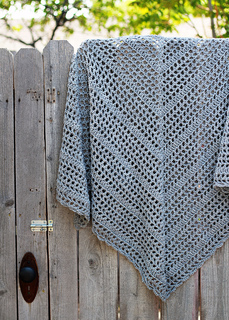 SKILL LEVEL - EASY: This pattern is easy enough for someone who has just learned to crochet. 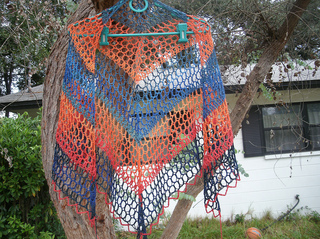 It uses simple stitches and works up quickly due to the large hook size and bulky yarn. No chart is included in this pattern. 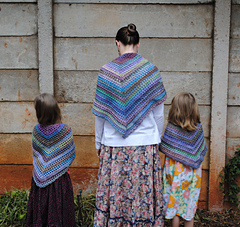 This pattern makes a wonderful prayer shawl that is generous in size, uses only two skeins of yarn, and works up very quickly!